Look at a map of France and that large area curling around Switzerland and Italy can get a little confusing, since the French government reorganised its regions and created 13 vast metropolitan areas from the previous 22. The great news is that the intricacies of French regional politics do not affect the quality of the snow or the après social scene and France has all that in abundance and variety. Popular places to ski in France sit in the eastern and south-eastern regions: Auvergne-Rhône-Alpes, Provence-Alpes-Côte d’Azur, Bourgogne-Franche-Comté, Grand Est and Occitanie. If you do not recognise some of those names, don’t worry, some people living in them don’t either! However, when you are planning your ski holidays, it can help to know your Alpes from your Auvergne so here are the basics of French geography. Reaching halfway across France, this vast region was created by adding Auvergne in the west onto Rhône-Alpes in the east. It is the same size as the Irish Republic and home to over seven million people. The Rhone-Alpes bit will be most interesting, including places like Savoie, Haute Savoie, Hautes-Alpes and Isere. It is, in fact, the world’s largest ski area, with 160 resorts including Courchevel, Meribel, Val Thorens, Chamonix and Morzine. Property here can be pricey – for a good reason, skiing is superb – but there are also cheaper areas, such as Les Deux Alpes and Les 7 Laux. Les Deux Alpes offers a high altitude (1650m) and reasonable prices for ski lifts, lifestyle, and homes. South of Rhône-Alpes, the region nicknamed PACA for short has the advantage of being close to the Italian border and the Mediterranean, offering the possibility of skiing in the morning and, if not swimming in the sea in the afternoon, at least enjoying the view of the seafront at Nice or Cannes. Isola is the closest to the Med (75 kilometres from Nice) and is an excellent resort for beginners. Further north is Serre Chevalier, with over 400 acres of pistes between 1,200 and 2,800 metres and including famous names like Briançon. A home in a town like Briançon has ski season appeal, being next to the Écrins National Park. Elsewhere the region offers a string of pretty villages where you can enjoy that wonderful French lifestyle but where you happen also to ski for a third of the year. It is that age-old question: sizes matter? Home to more than half of the world’s ten largest ski areas, the French Alps has nothing to be embarrassed about in the size department. So, what is the region’s undisputed world number-one for variety of slopes. Since 1973, it has been possible to ski the interlinked valleys using a single pass, making it a vast snowy playground for ski and snowboarding enthusiasts from across the globe. So where should you begin your house hunt in the daddy of domains? Courchevel: Long maintaining a reputation as the top ski resort, this world-renowned, elegant destination breaks down into four main villages: Le Praz 1300, Courchevel 1550, Courchevel 1650 and Courchevel 1850. 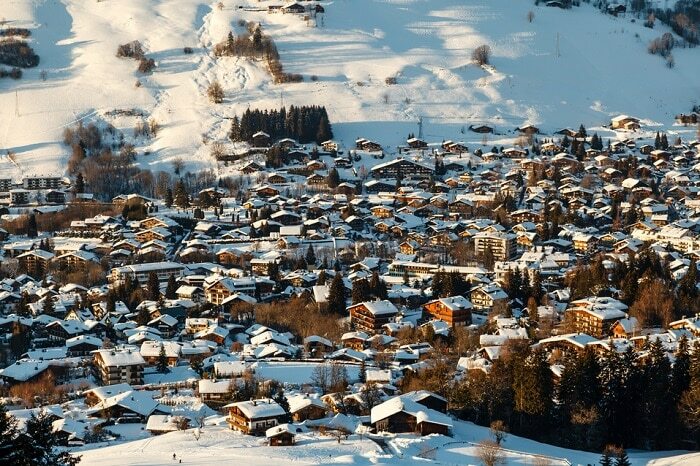 Meribel: sat in the middle of the Three Valleys, the Meribel valley splits into four distinct areas: Meribel-Mottaret, Meribel, Meribel Village and Les Allues. La Tania: located between Courchevel and Meribel, lying at an altitude of 1400m, La Tania is a family-friendly resort set in beautiful surrounds of a pine forest. Les Menuires: nestled between Val Thorens and St Martin de Belleville, not only is Les Menuires an excellent choice for beginners, but it also has unique après activities for all ages. St Martin de Belleville: the family-friendly resort of St Martin de Belleville is a quieter, affordable base for exploring. Keeping in line with the more traditional feel of this village, après revolves more around local bars than larger international venues. From upmarket Courchevel to affordable and unpretentious Les Menuires there’s something for everyone. Off-Piste animals, first-timers, millionaires and property buyers with a somewhat more modest budget will be guaranteed to find their idea of high heaven; such is its reach both on and off the pistes. Imagine the scale of the outcome if you linked two mountain resorts and their surrounding slopes in the heart of the French Alps, to create an interconnected alpine playground? That happened in December 2003 when the purpose-built, multi-levelled resorts of Les Arcs and La Plagne, plus their smaller neighbours, joined hands courtesy of the €15 million Vanoise Express double-decker cable car to create the Paradiski area. Ranked number three in the world in terms of size, this vast snowy expanse boasts 425 kilometres of endless pistes and 261 slopes, all of which is skiable up to an altitude of 3250 metres. So, the slopes and super-fast lifts that whisk you to the top are top notches in the mighty Paradiski, but what about the resorts in France you could call home when you snap up that alpine retreat you have been pining after? If you like your French resorts more contemporary than traditional, traffic free and apartment-heavy, then you need to look no further than Les Arcs. Set high above the town of Bourg St Maurice, the resort comprises seven purpose-built villages scattered across the massif central of the 3226m Aiguille Rouge. Situated two kilometres apart both Arcs 1600 – the first Arc – and 1800 comprise large apartment blocks sat at the foot of their slopes. 1800 is most extensive of all the Arcs, and has expanded up the mountainside – you can pick up a brand-new, luxury apartment here for less than £157,000. On the far side of the prominent mountain ridge – and separate from their lower altitude contemporaries – Arcs 2000 and 1950 are close neighbours. 2000 comprises half a dozen massive, linked apartment blocks, plus more built ski chalets. Just below it and connected by a short gondola, they built the mini-mountain village of Arc from scratch in 2003. If you thought Les Arcs was dispersed across the mountainside, then try La Plagne for size. Comprising 11 separate villages – some of which are miles apart – this unique resort stretches across a giant and gentle plateau alongside a steep mountain. Three are low-lying traditional farming villages, while the rest are purpose-built French ski resorts at different altitudes. Belle Plagne and Plagne Centre are the main hubs of the resort, providing the focal point for shops and après-ski. below Centre is the suburb of Plagne 1800, where you could buy a new two-bed apartment for less than £293,000. Our love for skiing and snowboarding means we will do whatever it takes to hit the slopes. If that involves trudging to the cable car in heavy boots while carrying our equipment, or cramming onto a crowded bus then so be it. However, it does not have to be such a chore. Imagine rolling out of bed straight onto the mountain, before returning right to your front door when the days shredding is done.France is the spiritual home of the ski-in/ski-out resort. We are not talking about alpine locations that contain a few slopes-side residences; it is purpose-built resorts high in the mountains that are all about the sport. In the vast French/Swiss Portes du Soleil ski area, this mountain resort above Morzine offers a perfect skiing environment. Avoriaz has been car-free since it was created in the 1960s, an accessible policy that adds to its charms and makes its facilities essential and high-quality. What happens if you scatter 11 separate villages across a vast plateau alongside a steep mountain? Head to La Plagne, and you will find out. Many communities are purpose-built ski-in/ski‑out resorts at different altitudes, with convenient access to neighbouring Les Arcs via a double-decker cable car. 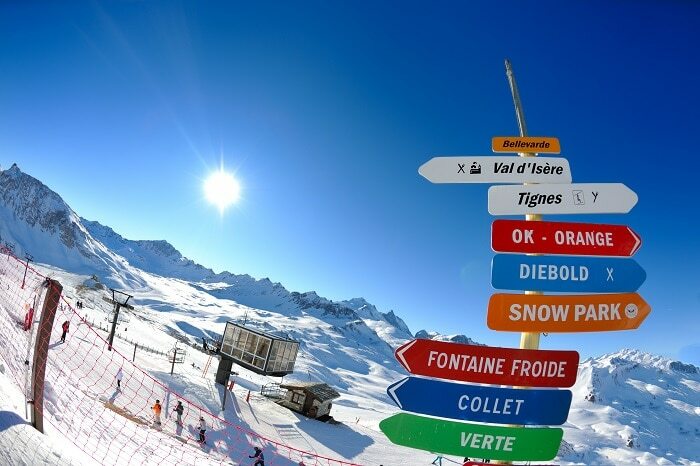 Les Arcs spoils skiers with choice. Constructed in the 1960s and 70s the original Arcs 1600, 1800 and 2000 comprise big, wood-clad apartment blocks. However, it is the newer yet more traditional Arc 1950 that offers an appealing base from its ski chalet style buildings. Best Ski Resorts for Beginners: In this article, we look at the best mountain retreats for newcomers to this sport like Meribel and Alpe d’Huez. Reviewing ski schools, slope conditions, rental shops to hire equipment like skis and ski boots, private instructors for ski lessons, and more, we have listed our four favourite destinations to help you get started. Mountain Resorts with Guaranteed Snow Fall: Snow conditions are everything. They break or break a ski holiday. We look at popular places to ski in France that have sure-fire snowfall, and whether they offer additional skiing activities like night skiing, heli-skiing and cross-country ski routes.